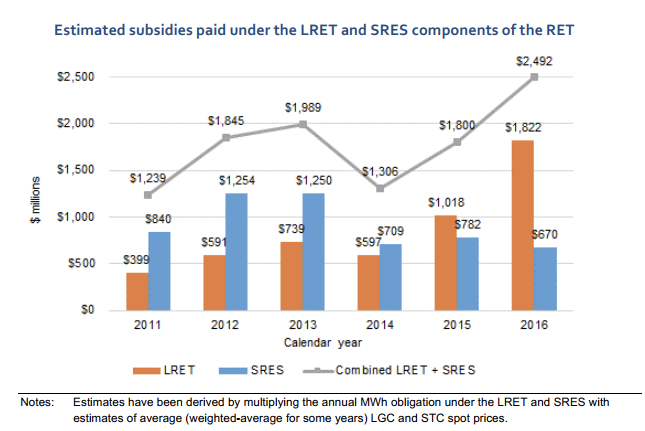 A high-efficiency, low emissions (HELE) coal-fired station would cost less than the almost A$3 billion (roughly $2.3bn) of subsidies handed out for renewable projects each year, a study published Monday argues. According to the report released by the Minerals Council of Australia and COAL21 Fund — a nest egg owned by local coal producers —, the sum required to build a 1000MW ultra-supercritical (USC) coal-power plant is A$2.2bn. 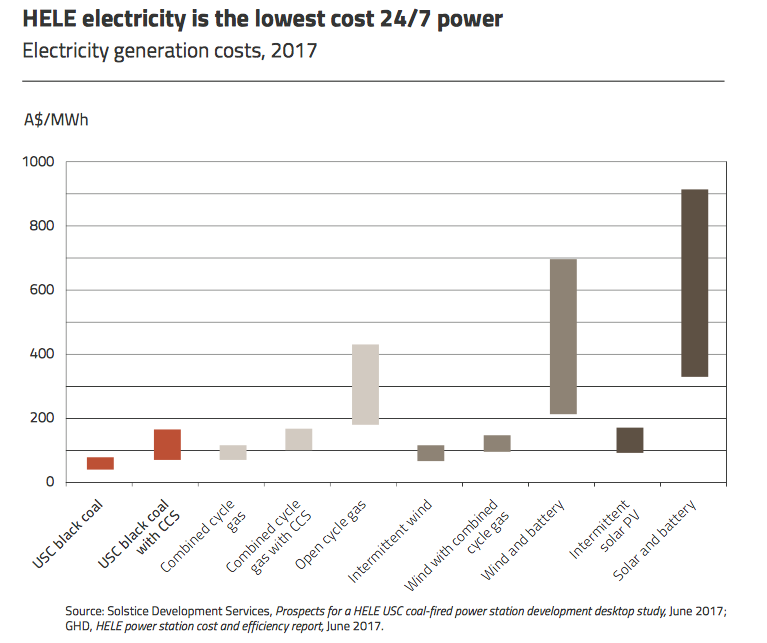 The figure, based on data compiled by power and energy sector specialists GHD and Solstice Development Services, not only is lower than the total subsidies for renewables, but it would generate the cheapest electricity on the market, the study says. 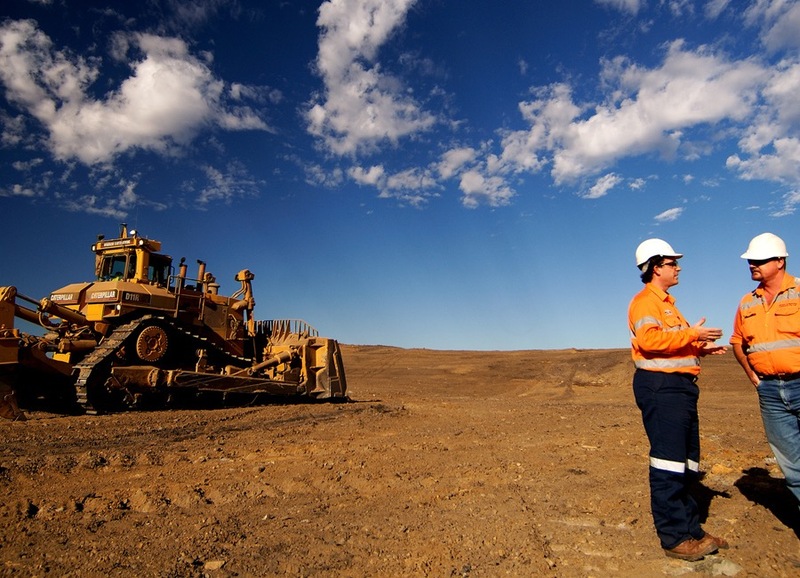 Source: BAE Economics for Minerals Council of Australia. A HELE coal plant would produce electricity at $40-$78 per megawatt hour, compared with gas at $69-$115/MWh and solar at $90-$171. That means, according to the study, that clean-coal plants could drive down energy­ prices in Australia. That outcome would be more than welcome by consumers, which are bracing for a 20% increase in electricity costs between 2017 and 2018. On top of that, an increase in electricity demand paired with a drop in supply since 2014 have strained the Australian grid, causing outages amid heat waves and storms. The worst — an eight-hour blackout in South Australia last year — crippled industry for up to two weeks and triggered public outrage. mitigate rising electricity costs, particularly for vulnerable and elderly households. Addressing this challenge is akin covering a floor with a rug where the rug is just a bit too small. natural gas is significantly cleaner than coal and can readily provide stable energy supply, but its cost is rapidly rising on the international market. In short, each of these three primary sources of power solves two of three problems. No matter how you position the rug, one of the corners of the room is uncovered. In addition, authorities would have to deal with the fact that none of the country's major generators — AGL Energy, Engie, Origin or EnergyAustralia — wants to build new coal -fired plants, as their customers and shareholders push for cleaner energy. Coal -fired power has fallen to around 63% of Australia's total generation as of 2015, official data shows, down from around 80% in 2000.